Brian Ború (Middle Irish: Brian Bóruma, Irish: Brian Bóroimhe) Mac Cennétig (c. 941–23 April 1014), was born at Kincora, Killaloe, a town in the region of Tuadmumu (Thomond), the son of Cennetig (Cennedi) and Babhion or Bebinn. Members of the Dál gCais (or Dalcassians) tribe, the family had an ancient royal ancestry. The youngest of twelve sons, Brian would become the 175th King of Ireland, the founder of the O’Brien dynasty and the ancestor of the Kings of Thomond. Brian was an excellent harp musician and the harp has become a symbol of peace and unity in Ireland in his memory. Ard Rí In 1002, Brian was recognised as Ard Rí, High King of Ireland, thus ending the six hundred year reign of the Uí Néill’s in Leinster. Breaking from tradition, he ruled from Kincora Castle in Killaloe instead of Cashel, thus making Killaloe the “Capital of Ireland “. Brian’s name was inscribed in the Book of Armagh, in gold lettering, as “Emperor of the Irish” in 1005 during Brian’s campaign in the north of Ireland. After forty years of incessant warfare in his early life, Brian devoted his mind to works of peace. He rebuilt the monasteries that had been destroyed by the Danes, and erected bridges and fortresses all over the country. He founded and restored schools and colleges, and took measures for the repression of crime. Maelmordha, brother of Gormlaith, third wife of Brian, who had usurped the crown of Leinster in 999, rebelled against Brian’s rule in 1013. Conspiring with Sitric, son of Gormlaith, the two resolved themselves to overthrow Brian. They along with Dane Vikings of Northern Ireland in Leinster and Dublin, as well as native Irish rivals to Brian, gathered their forces in rebellion to Brian in 1014. Two Norwegian princes, Bróðir and Óspak at the head of a thousand troops, arrived to reinforce the Danish contingent. As the Danes prepared for battle at Clontarf, they numbered sixteen thousand, as well as troops from Leinster under their king, Maelmordha. With a force nearing thirty thousand, including the Dalcassion Knights, Brian marched into Leinster, where Malcolm II, King of Meath, joined him four miles outside of Dublin at Clontarf. Arriving on Palm Sunday, the battle would occur five days later on Good Friday. All of the accounts state that the Battle of Clontarf lasted all day and was a bloody affair. Brian Ború’s troops would win this battle to keep a unified Ireland, but this would not to be a glorious day. High King Brian Ború died on this day, Good Friday, 23 April 1014. There are many legends concerning how Brian was killed, from dying in a heroic man-to-man combat to being beheaded by the fleeing Viking mercenary Bróðir while praying in his tent at Clontarf. High King Brian Ború is said to be buried in the grounds of St. Patrick’s Cathedral in the city of Armagh keeping with the pagan tradition that warriors or those who die in battle must be buried in the northern sections of graveyards. 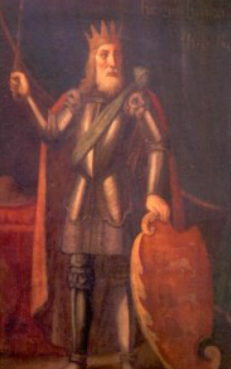 Brian Boru's coffin was carried to the Abbey of Swords from Clontarf, and attended by many elders of the Church. Here the wake took place; and he was afterwards buried at Armagh. His remains were later moved to a secret location, so no one could test his remains and claim kingship in the future. Milesius, of Spain around 1700 Brian Boru's ancient ancestor killed three lions while hunting in one day, and commemorated the achievement by using the three lions in his coat of arms. Much later Brian Boru used them on his shield. (Gold & Silver ) or loose them altogether. Because Henry VIII also had three gold lions for his own coat of arms. 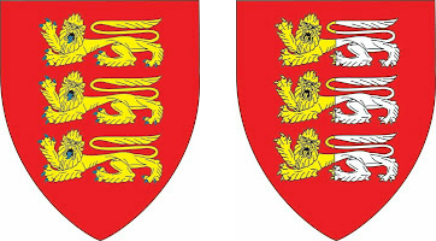 Murrough O'Brien choose to divide the lions thereby keeping the coat of arms for all O'Brien's. As a result of Murrough's allegiance Henry VIII made Murrough 1st Earl of Thomond and 1st Baron of Inchiquin. Thus the O'Brien's are the only clan in the British Empire allowed to bear the Royal arms and to dress their servants in scarlet livery. This is because Murrough O'Brien was not raised to Earldom from a lower order of nobility, but entered the English peerage having been the Sovereign ruler of an independent kingdom. That's why we are the Royal O'Brien's. Brian Boru's Crown, Sword, Scepter, Ring, Harp & Shield. When Brian's son Donough went on a pilgrimage to Rome he took them with him and laid them on the Popes alter, he was too old and weak to return to Ireland so the Pope gave him some land to live out the remainder of his life there, he is buried there in his own church which you can visit by arrangement. The following items came back to the family later in modern times. The Crown, Ring, Sword, Shield, and the Harp. However the Crown was melted down and made into something else and given to King Henry VIII of England. The Scepter was not reported to have been returned to Ireland, although that can not be confirmed. Welcome to our Family Website, which has been set up for all O'Brien's in the United Kingdom and Europe.